It’s official….. I am a thirty-something. I spent the last 24 hours here. while I was surrounded by my husband, my three best friends (my sisters) and their two spouses & one spousal equivalent. How cool is this sign? While we were getting pampered, the boys were playing golf here. They may or may not have been dripping with sweat, as it climbed to 97 degrees. But don’t you worry, because my sisters and I were nice and cool inside a little place we like to call a Spa. Can you tell it was my best birthday yet? I love it. You look gorgeous! AMAZING birthday weekend - that place looks wonderful! Just left a comment but it didn't publish!...hope this doesn't come up twice!! Your pics are beautiful, and it's hilarious that the top arrow on that sign is Burlington, Ont...about an hour and a bit from where I live..lol! I have two sisters and we are super CLOSE in age and in heart. Best friends for life...Love It!! Beautiful dresses, you all look GREAT! Happy bday! Live a life filled with JOY. I am a wife to Steve and a Mommy to three little girls, Mia, Sophie and Gracie. Our family also includes our two dogs and one cat. Also girls. Our house truly is a Haus of Girls. Poor Steve! 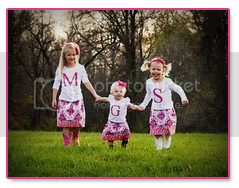 Our girls are my inspiration for all that I do. I am thankful to spend each day with them as they grow and learn more about life and the world. I feel complete, now, raising my family. No career or money is worth more to me than my little girls and being here for them everyday. When I am 85 sitting in a rocking chair, I will have no regrets. I will know I lived my life to the fullest and gave my girls the best gift in the world... their momma by their side. "Your children need your presence more than your presents."